The year was 1952 when Lily Mills released their Design Book No 67. It's not a large book, or leaflet; just 15 pages, and not really jam packed with patterns; just 8, but 8 quite nice patterns they are. The official name is Lily Doilies. And, as indicated, there are a couple doies, but there are far more place mats. 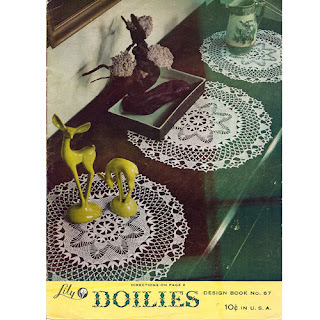 There are also a couple attractive filet crochet designs here, as you might expect with it being a 1950s issue. Here, let me know you in this photo journal. Forget Me Not Doily set includes a large mat, a bread and butter doily, as well as a glass mat. Use them, or not, as a luncheon set. created at 17, 19 or 20 inches. form a mat of 12 x 18 inches. Cherry Roll and Garden Party Place Mats give two summery options for Summer display and use. smaller pieces (size of your choice), to complete a set. So what do you think? 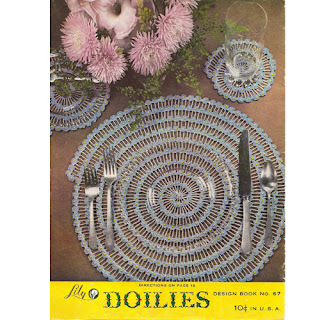 In particular, I think the Zinnia doily is spectacular and the Cherry Roll Place Mat would be so fun on a picnic. And, that Hexagon doily has one of the most intriguing borders I've seen. These patterns are in my shop; just click the link below the pictures, should you be interested. Either way, hope you enjoyed the photo journal.